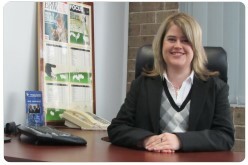 Megan joined Berger Piepers in 2005 after completing her Bachelor of Business Degree at Charles Sturt University. Megan has over 6 years experience in the areas of Business Services and Taxation. She has had experience with a variety of small to medium size business entities; including preparation of income tax returns, audit of superannuation funds, assisting clients with the implementation of Myob accounting software and day to day operations, various accounting and taxation matters. Megan has completed the Chartered Accountants program.